Geoffrey Rowan, the president of the Miami Business School’s Graduate Business Student Association and current full-time MBA student, was recognized by the Miami Herald’s Legacy Miami in their ‘40 Under 40’ issue. This special issue recognizes distinguished group of young Black men and women who are making a difference within the South Florida community. “I was recognized for my leadership within the Miami Business School community, as well as in the community as a whole through organizations such as United Way and One Miami. 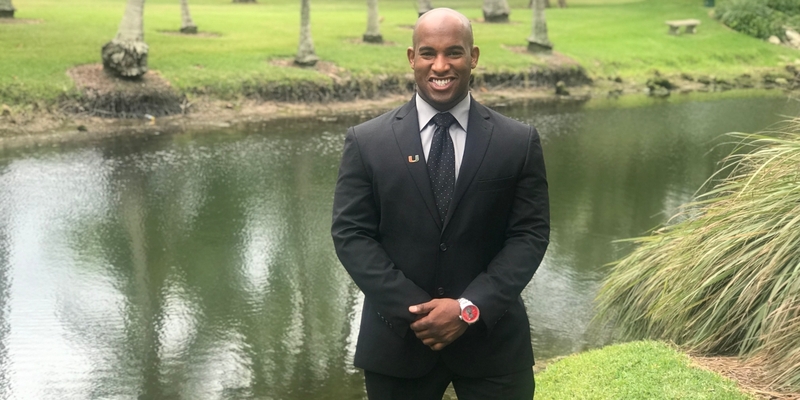 The recognition was also for being an innovative, passionate, and impactful young Black man within my communities through work with my own company, Greater Than University, and in the creation of GBSA events, like the Miami Business School's inaugural Sports Business Panel,” said Rowan. “MBS has opened doors to different networks through the various departments like Ziff Graduate Career Services, Graduate Business Programs, and Development and Alumni Relations, where I was able to pursue my passions of branding and creating a larger sense of community and teamwork. It is through the people in these departments where I have gained knowledge about the community, met incredible mentors and alumni, and created relationships and networks that will last a lifetime,” said Rowan. “Since I arrived to business school, my goal was to leave MBS a better place than when I arrived. I wanted to be a brand ambassador and give back as much as I knew the school would give to me. That's the legacy that I hope to leave,” he said. We look forward to watching Rowan’s continuing success.